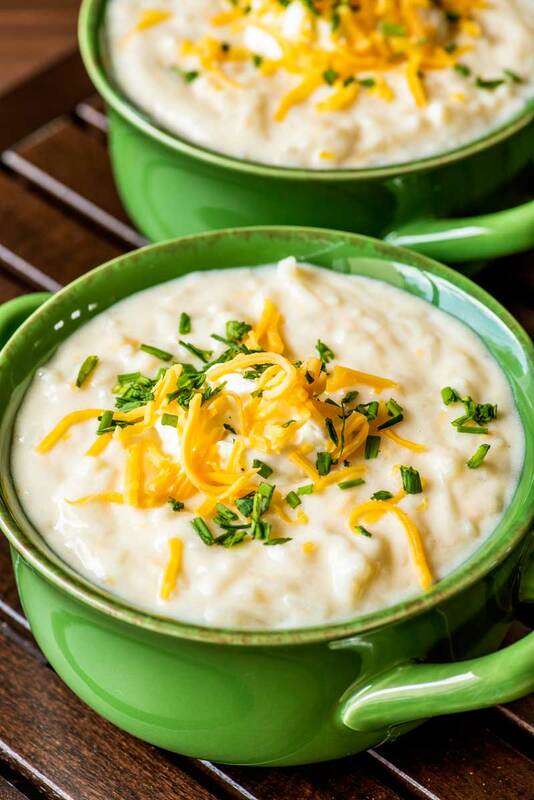 This ultra thick and creamy crock pot potato soup is made with shredded potatoes, thick broth, and creamy cheese. It's pure comfort food for any time of year! 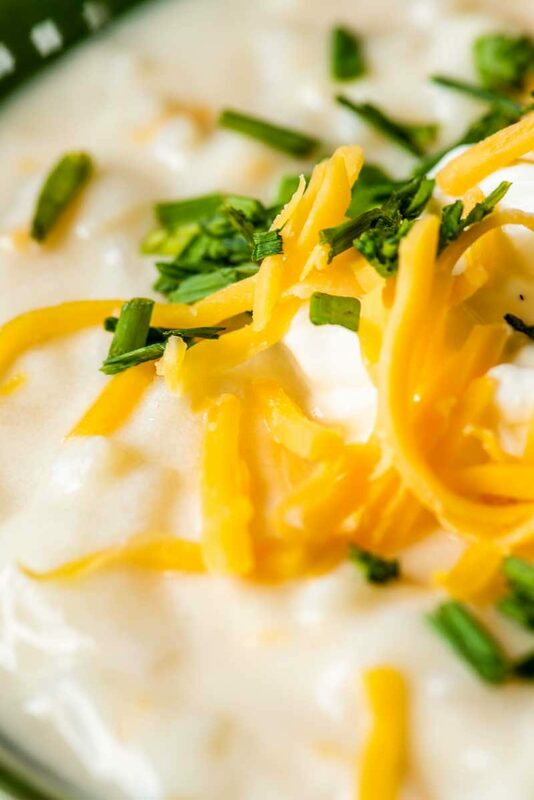 No matter what time of year it is, I always have room in my life for a big bowl of creamy potato soup. And for whatever reasons, my cravings for it this week were at their peak. Maybe it’s because I’m perpetually dreaming of fall weather. Maybe it was a rough week and it was my stomach’s way of saying I needed some comfort. Or maybe because it’s one of my favorite go-to recipes that I didn’t have ingredients for in the house (so of course I develop an irrational craving for that one thing). But no matter the reason, the occasion, or the position of the moon, I simply had to have my favorite potato soup in my life this week. Which, of course, now means I’m sharing that ultimate potato soup recipe with you. How long is potato soup good for? Once made, this soup can be stored in a sealed container in the refrigerator for up to three to four days. Can you freeze potato soup? This soup contains milk, and because of this, I can’t recommend freezing it. 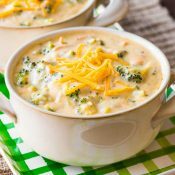 Milk typically separates once frozen and it will give this once-creamy soup a grainy texture when thawed. 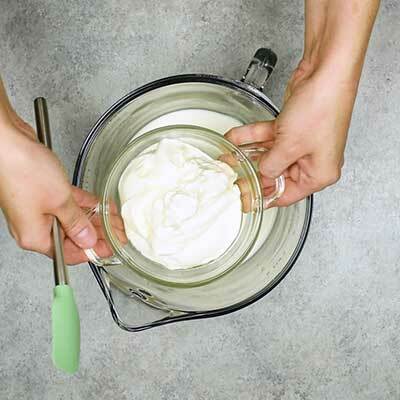 You can try whisking it back together or adding fresh cream to save it, but sometimes, the damage is already done. However, if you simply must freeze this soup and are willing to do what it takes to bring it back to glory, it can be done. 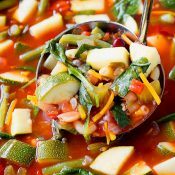 To freeze this soup, allow it to cool in the refrigerator for at least four hours or ideally overnight. Once chilled, transfer soup to freezer containers or bags of your choice. Potato soup can be frozen for one to two months. When ready to eat, let the soup thaw in the fridge. 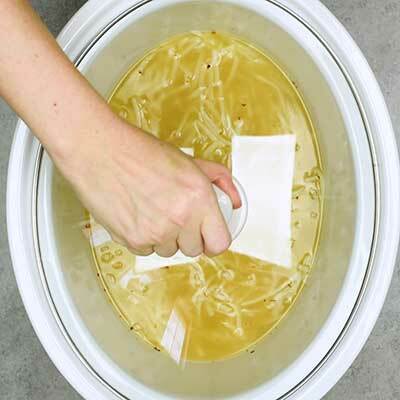 Once soft, the soup can be heated by using the “warm” setting on your crock pot for an hour or so. What to serve with potato soup? If you’re serving soup as the main course, you might be wondering what else to serve with it. 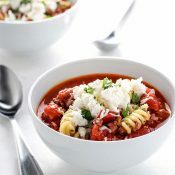 And I totally get it; soups are one of those gray areas where it can be an appetizer, side, or main course, and each situation can call for different options. Bread. 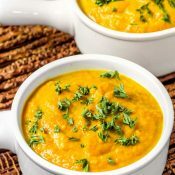 Whether it’s plain toasted bread, a bread baked with cheese, or even some simple sandwich, anything with bread is bound to be a good compliment to soup. Salad. And when serving salad with soup, I try to pick a variation that has different (yet complimenting) ingredients to the soup. Leafy salad or hearty pasta salads are always a good fit. Meat dishes with minimal seasonings. You don’t want the other recipe to totally steal the show, but a lightly flavored chicken or beef dish would go great with potato soup. I recently upgraded my crock pot to one that comes with bowls for 2.5 Quart, 4 Quart, and 6 Quart and I highly recommend it! It’s so nice to have one unit that can make fabulous dinners and heat up party dips. You can pick one up here: Choose-A-Crock Programmable Slow Cooker, 6 quart/4 quart/2 x 1.5 quart. Once you’ve made this soup, you may want to serve it up in some classic soup bowls. I have these soup bowls in a few different colors and love them! 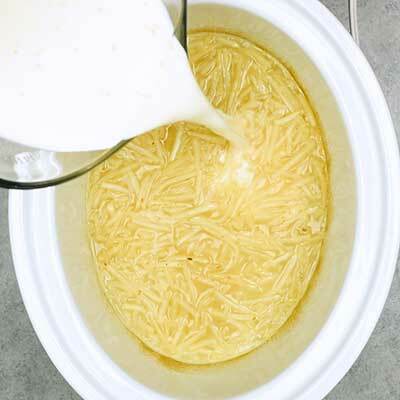 Step 1 – In a large crock pot, add the shredded potatoes, chicken broth, salt, pepper, and red pepper flakes. Give the ingredients a good stir, then cover. Step 2 – Let the crock pot cook! 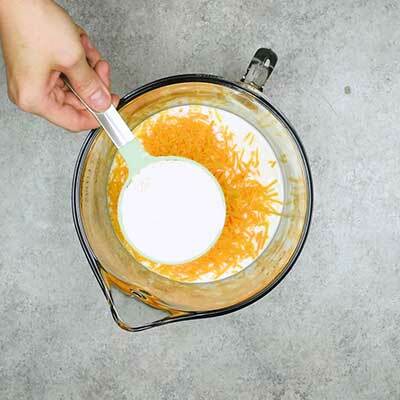 Step 3 – In a medium bowl, whisk together milk, sour cream, cheddar cheese, and flour. 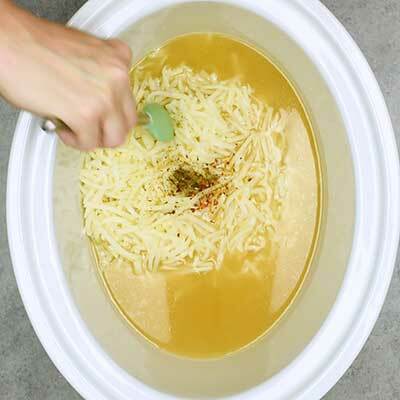 Lift the lid of the crock pot and pour in the milk mixture, give the soup a quick stir, then return the lid. Step 4 – Let the soup cook a little bit longer. 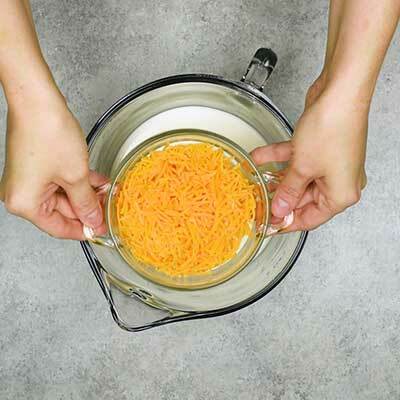 Step 5 – Remove the lid, give the soup a final stir, and serve! This recipe was originally published on May 1st, 2015. It was updated with new text and photos on July 27th, 2018. 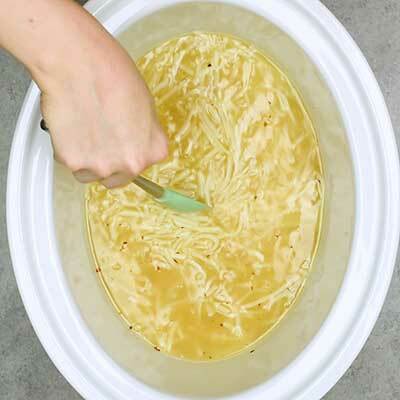 In a 6 quart crock pot (or larger), add shredded potatoes, chicken broth, salt, pepper, and red pepper flakes. Gently stir ingredients together. Cover crock pot and cook on HIGH for 3 hours or LOW for 6 hours. 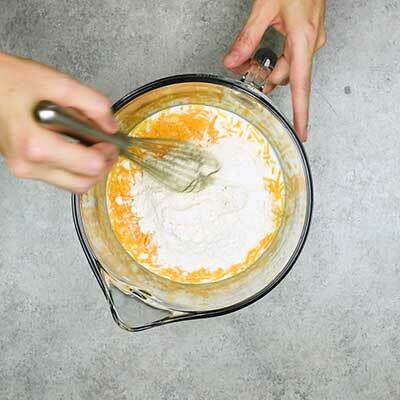 In a medium bowl, whisk together milk, sour cream, cheddar cheese, and flour. 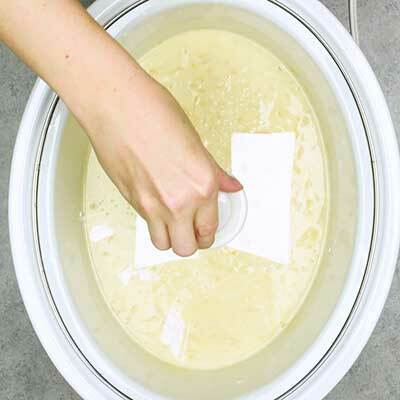 Remove lid from crock pot and pour in milk mixture, then stir. Cover again and cook on HIGH for 30 minutes or LOW for 1 hour. Remove lid, stir soup, then serve. 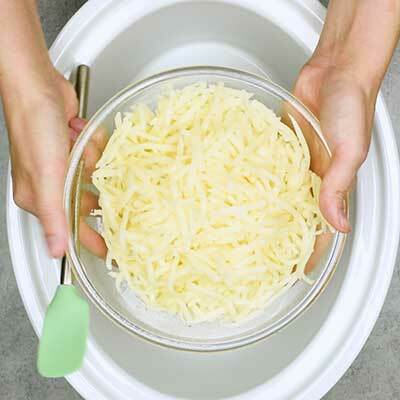 Garnish bowls with more cheese, a dollop of sour cream, and chopped chives. I’ve been craving potato soup and these pictures make me want it more. I love using my slow cooker and it’s even better once the weather warms up! I’ll take a bowl of soup during any time of the year. I don’t care if it’s starting to get warmer out either! 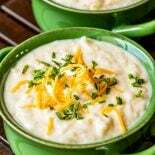 Thank you for sharing your recipe, I also find it hard to figure out what type of recipes I’m going to use in making creamy potato soup to my wife really happy and proud but Also, thanks for the tips. 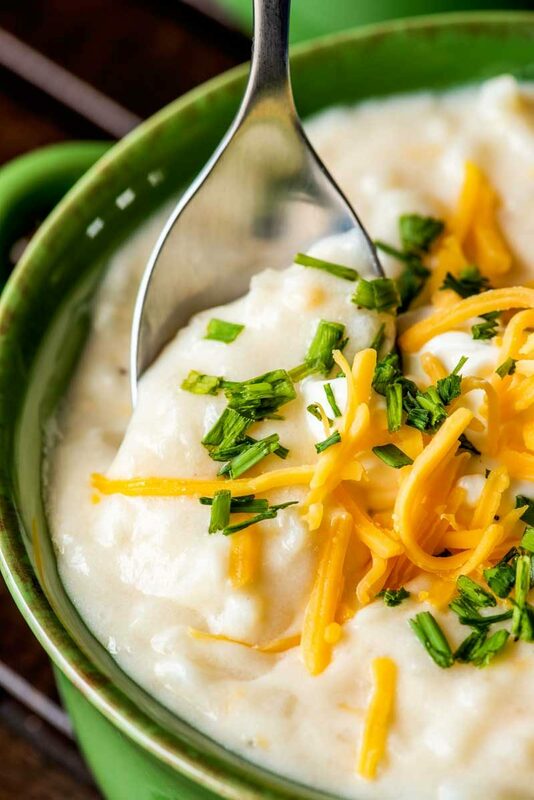 I hope I’ll be able to make such delicious creamy crockpot potato soup like yours. First of all – thank you for posting this recipe! Definitely a time saver compared to my stovetop recipe. I did alter this one slightly by adding sautéed onion (3/4 cup chopped sweet onion and 4 tbsp butter) once I had tasted the finished product. Tres bien! I like that addition Kelly 🙂 When I first posted this recipe, I wasn’t too keen on onions, but the times have changed and I’m a big fan of them now. Will have to try adding them the next time I make this! I added the diced onion sautéed in 4 TBSP butter and a tad of Berber pepper. Also used my immersion mixer to smooth the soup. Super soup!!!!! Can this recipe be adapted to Instant Pot. Just learning to use mine. I followed recipe exactly and it looks broken and tastes a little like flour, where did I go wrong? 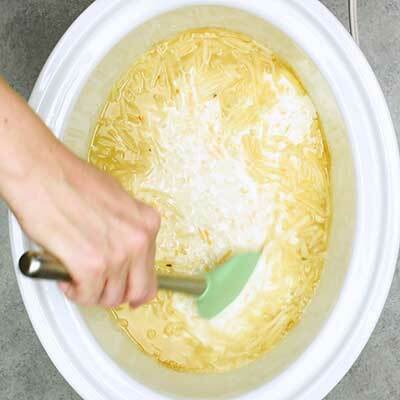 If the soup boiled after adding the milk/sour cream mixture …. then that is why it is “broken” … i don’t agree with this method !!! 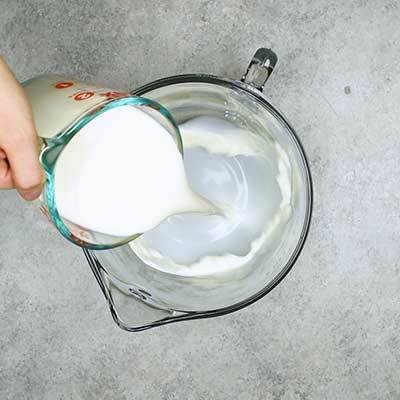 Reduce flour by 1/2 and sub with cornstarch. See if that helps … try using a stick blender to repair “broken” soup! 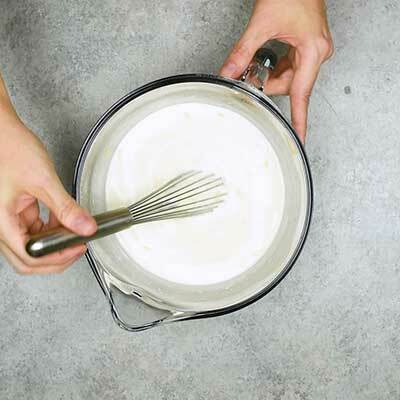 You could also use instant mashed potatoes in place of flour or cornstarch to thicken. Just add a little bit at a time until it’s to your liking. Would it be possible to substitute a veggie broth for the chicken broth? Praying that it came out well because of an error in the instructions, see both step 3s to the inconsistencies. I added the flour to the cooker a minute after I realized. Hope it comes out well. Very excited to try and make this! If I wanted to add some bacon when should I add it in? Also how much do you recommend? Hey Samantha! 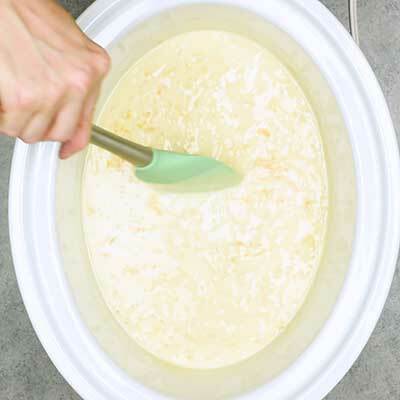 The flour is mixed with the milk, sour cream, and cheese, and then that milk mixture is added to the crock pot near the end of cooking 😀 Good luck with the soup, I hope it turns out well! I doubled this recipe and brought it to work. I cooked it for 5 hours and it never thickened. It stayed looming clumpy and separated. I wound up not serving it. Made this for dinner tonight and it was yummy! I have been searching for an easy to make recipe for potato soup and I’ve found it!